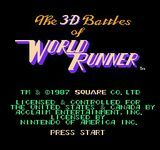 3-D WorldRunner features many elements that are typical of a forward-scrolling rail shooter game, where the player focuses on destroying or dodging onscreen enemies against a scrolling background. 3-D WorldRunner incorporates a distinct third-person view, where the camera angle is positioned behind the main character. As WorldRunner, players make their way through eight worlds, battling hostile alien creatures and leaping over bottomless canyons. Each world is divided into different quadrants, and the player must pass through each quadrant before the time counter on the bottom of the game screen reaches zero. In each quadrant, the player can find pillar-like columns that house power-ups, objects that are beneficial or add extra abilities to the game character. At the end of each world's last quadrant is a serpent-like creature which must be defeated to advance. A status bar at the bottom of the screen displays the player's score, the time counter, the world number, the world quadrant, the number of bonus stars (items that increase the player's score count) collected by the player, and the number of lives, or continues, remaining. Source: Wikipedia, "3-D WorldRunner", available under the CC-BY-SA License.